It’s been 70 years since the historic day of 15th August 1947 and some of the Taj properties across India have come up with a promotion so beautiful. The recreation of the pre-independence dinner at the Taj Mahal Palace in Mumbai in 1947. The idea all materialized when someone at the Taj Mahal Palace in Mumbai, stumbled across a menu from the night and this converted to the food we sit to partake, a recreation of India’s past. The menu for the purely non-vegetarian and the menu was purely eclectic French and Continental. French Cuisine was going through a revolutionary phase and chefs had been employed from Goa and other European occupied states to give it that deft touch. Although the original recipes aren’t available, Chef Nitin Mathur and his team at the Taj Krishna have done a fabulous job at recreating the original menu. We started off with the Consomme al indienne. The Consomme was crystal clear, with the enhanced flavors of the chicken shining through. The julienned veggies on the bed, showcasing the colors of India parted out as the consommé flowed right through. I thoroughly loved it. The appetizer of the night is one which didn’t feature in the original menu and had been added in. Delicacies a’l Hindustan literally translating as ‘Delicacies of Hindustan’ were three cottage cheese in three different variants of marinade. The mains comprised of Paupiette de Saumon joinville (Salmon roulade, soft creamy mash, wilted spinach, turned vegetables and Joinville sauce), Poularde Souffle Independence (Chicken soufflé with steamed vegetables and lemon parsley sauce), Crepes aux epinards (Stuffed spinach crepes with Makani gravy) and Campignons vol au vents (truffle and wild mushroom with paprika cheese sauce). It was the Vol-au-vent which was my pick for the night. A classic Belgian dish, the vol-au-vent is a stack of puff pastry with filling of either mushrooms or chicken. The mushrooms give earthiness and with the crunch of the fluffiest puff pastry, this is an absolute beauty. The set dinner ended with Vacherin de peches liberation (Peach infused Apricot Sorbet) served in Meringue cups. Having the sorbet alone was a bit too sweet for my palate, but it wasn’t until I broke down the whole dessert on my plate, that the deftness of it all shone through. The recreation of the 1947 Menu at Encounters, Taj Krishna is a niche menu that comes along once in a while. It’s India’s history on a plate and with a pricing of Rs. 1947/-, this is one worth indulging in. It’s been almost 5 years now that I’ve moved to Hyderabad and it’s safe to say now that the city has embraced me completely. With Ramzan now here, the city is decked up with flickering lights, Haleem in every nook and corner of the city’s alleyways and gorgeous street food. The first time when I had come visiting Hyderabad during the Ramzan season, my parents who were strict conservationists kept my away from having my Haleem. It was more of the thought of mixing Beef with Mutton in any of the Haleems served across the city. But they’ve now given up on after hearing of the endless tryst with different meats from across the world. So approximately 5 years back is when I had my first taste of the dish that I had heard so much about. It’d be safe to say that it was the worst thing I ever had in my freaking life. It was in one word – Yuck. I gave up on the worst looking dish ever made on earth. Needless to say that whole month of Ramzan that year was spent eating everything else but Haleem. Then arrived 2012 and by then I had made a number of Hyderabadi friends. With Ramzan arrived a fresh batch of homemade Haleem by one my friend’s mom. Falteringly I took my best bite and my completely perspective of the entire dish changed with that bite. It was exquisite, smooth and full of flavor. I literally still can’t comprehend how a dish which looks like it had been thrown up after an after-party, taste so good. Then started my Haleem quest in Hyderabad. From literally visiting each eatery to try their fare to becoming a self-confessed expert critic at it. Also a point to note is that the original Haleem just like the Kacchi Gosht ki Biryani tastes nothing like the ones made commercially. Haleem at point in the city was served 365 days of the year. But there was a lot of time and patience that went into making the dish and also the heaviness of it. It was then that it got relegated to being a Ramzan only special. Hotel Nayaab was the first to start serving Haleem commercially in the hotel before the rest picked it up. The now famous Pista House was instrumental in getting the GI tag for Haleem for Hyderabad. It’s now become as much a part of the city as the Charminar itself. As the city progresses, so does it’s cuisine. Restaurants started serving variants like the Emu, Fish, Topping it Zubaan and Chicken 65. 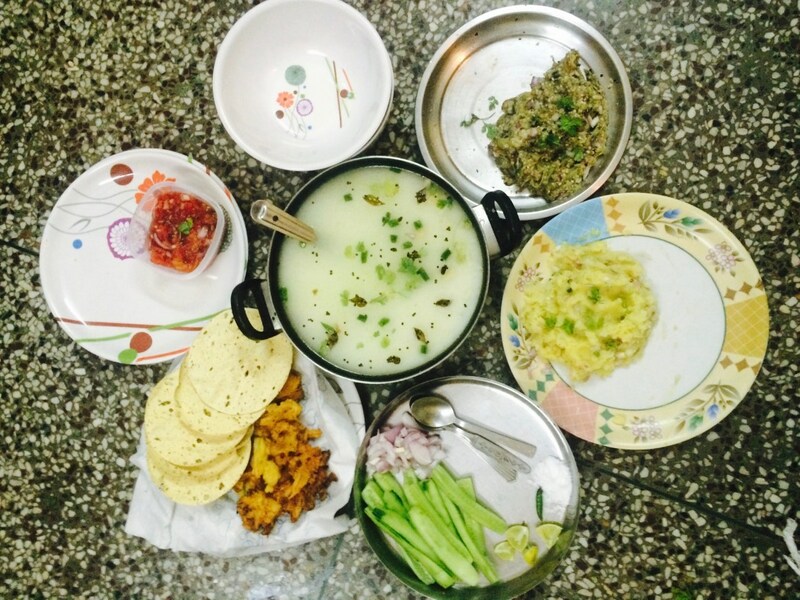 The wow factor of the dish had finally descended on us with some going far out to making Haleem with Oats, Italian herbs of Oregano and Thyme. But they forgot to realize one important factor. Haleem is a wheat dish first and the red meat is secondary. It is all about getting the consistency of the wheat beaten to correctness while the meat melts away in the pot. For me it will always be the perfect fulfilling dish it’s meant to be. Next throw in the brown onions, fresh mint and cashews. You then generously add a ladle of Sherwa to have the best goddamn food that Hyderabad has to offer. You can still check out the 20 Best Places To Have Haleem in Hyderabad we compiled in 2015 below. The list shall now be updated once again with 2017. However, there is one place which lies in the bylanes of Nampally which should get it’s due in this regard. Deccan Achar has been making Biryani pickle for quite a while now. It’d be hard to find this shop if you were new to the area and didn’t ask for directions. Even Google Maps would send you in a circle for Nampally traffic is notorious for pushing you into corners you’d not think existed. Standing tall is the Deccan Achar where you’d see a throng of people busy having small plates in their hand as they taste each of the pickle varieties before buying them. From small packets to kilograms of the pickles, the customers parcel them in droves. I’d gone to Deccan Achar a couple of years ago while researching on interesting food and had totally forgotten about it. It wasn’t until that I got a call from Chef Kunal Kapur for new inventive pickles for his “Pickle Nation” that I did remember it. The pickles are all made in huge aquarium size-vats set along the walls of the shop. Like most commercial shops making pickles, they also do use a lot of vinegar. This super-speeds the pickling process but vinegar leaves a tingling sensation in your throat as you have it in pickles. The home-made Indian pickles though go through a rigorous process of drying and pickling before finally being put to use. Deccan Achar’s star product is their Biryani pickle. A product carefully made by the current owner to bring back business after he took over the reins. It was all about being the showcase-factor for the shop but it definitely worked. While I took a bite of the pickle, I could deny the quintessential aroma of Biryani you’d get once a lid is lifter off a freshly cooked one. As the owner explains it’s made using Biryani spices and mangoes without divulging any other secrets. I bought a packet to have with a portion of hot rice. This is when it all comes together. When mixed with steaming rice, it almost can be passed off as a Biryanish-Pulav. The taste is almost similar and can almost be passed off as a 2-cent Biryani. Not wanting to order-in and yet craving for a portion of Biryani? Mix a little bit of the pickle and you’ve got your lunch/dinner going. Hyderabad has had it’s Biryani-fication of various products. And the Biryani pickle from Deccan Achar adds into that list. They do have more than 50-60 other varieties of pickles including non-vegetarian ones. My favorite though is the Kariyapak (Curry Leaves), Karela (Bitter Gourd) and a Mango Green Til. It’s been a while that I’ve wanted to write an article on a dish which is very close to my heart. I grew up in a hostel in South India with the only two months of vacation that was during the summers. Hailing from Cuttack, the summers were extremely harsh and humid. No amount of lowering the temperature of the AC would work. But there was one dish which did the job which an AC couldn’t. Cue to the humble Pakhala. There is no right way of eating a Pakhala. Growing up in the South, I was used to eat Aurua or the normal rice you get around in the market. But the fact is that most of people in Odisha eat Usuna Bhaata (Par boiled rice) in their meals. We had our own fields just outside of Bhubaneswar which supplied the grains. 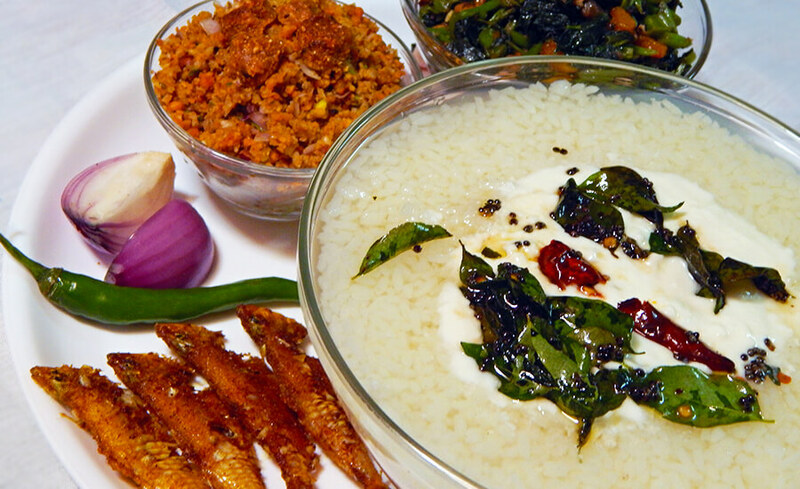 Like most other South East Asian regions, Odisha is primarily a rice eating state. Pakhala, as suggested by some linguistic scholars, has been derived from Sanskrit word ‘prakhyalana’ which means to wash down with water. But let’s get into the absolute details of the dish. Our family preferred rice both for lunches and dinners. So the best way of storing the leftover rice was to soak it in water. This was soaked overnight in water in a cool corner thus fermenting into Pakhala. With the next morning being super-hot with temperatures reaching around the 42-46C, it was time that the Pakhala made a grand entry. While my grandmother needed nothing with her Pakhala and had it just with Fish Fry on the side. But being the spoiled brat that I am and also being back from Hostel just for 2 months in the year, I could order for anything I wanted. So I waited around for my dad to return from the shop in the afternoon and create something unique called a Paga. Now Paga is a term you’d seldom find used outside of Cuttack. We Cuttakias are too spoiled for our good. Shutting shops for an afternoon siesta only to go back in the evenings. You’d seldom find a person on the street in the afternoon if he was a local shop owner. Paga is a term which can be loosely translated to creating a unique personal take on an already existing dish. Countless hours have been spent on creating the right paga for a dish. From crushing a lanka (green chili) to grinding a specific cut of ginger, add a squeeze of lime or not. Paga is all about individuality. Every person in an Odia household has his own style of Paga. The next hour in the house would be spent in cutting the necessary ingredients for making the paga for the Pakhala. The one made in our house had lemon leaves, crushed mango ginger, curd, salt, pepper, coriander and that’s it. We always preferred to use Mango Ginger instead of the regular to give it much freshness. If not using curd in the Pakhala, then you can add a squeeze of lime into the kansa. But Pakhala as a dish is incomplete without the sides. My family was so specific about them that nearly 10 different bhajas (fries) were made as accompaniments. There were the different types of saag (leafy vegetables) which my grandfather got back each time from his morning walk. He’d proudly fight with my dad for even getting a bunch for 1 Re lesser. That’s how most of our table conversations went with each trying to Alpha the other over who bought the vegetables at a cheaper price. If it was either Wednesday, Friday or Sunday we’d be lucky to get a fish fry. Rest all of the days were vegetarian days in our home. But the bhajas and chutneys make for a whole another story. Time would be spent in roasting many vegetables on the coil-heater while the bhajas were made beforehand. Now the same Paga concept applies to making of each of the chutneys too. As I got my kansa (bowl) of Pakhala, arranged alongside were the Aloo Chutney (Potato), Baigana Chutney (Brinjal), Bhendi Chutney (Okra), Sev Mixture Chutney, Badi Chura Chutney. The Bhajas had basically any vegetable that I mother could pull out the refrigerator for that day. Post finishing the rice, don’t feel left out in lifting the bowl to your mouth and cleaning away every last drops of torani. But the best part of Pakhala is still yet to come. Soon after finishing a bowl of the Pakhala, what follows is the best sleep you can get ever in your lifetime. There is a question I’ve been asked multiple times, “Why Jonathan’s Kitchen?” For people on my friend list to unknown who ping on the FoodDrifter FB page and Instagram. The number of times I’ve recommended Jonathan’s Kitchen or Komatose has been innumerable. There was a time when every 2nd day I’d been checking into JK. Then I became conscious about it, lest someone label it as too much of a favorite. It was then that I would be there but not check-in anymore. But photographing food as a habit that it is, that I’d whip out my phone and do a Insta Story of it. Both of Jonathan’s Kitchen and Komatose has been a hangout for me of sorts. And this post is an ode to those countless hours I’ve spent there. I always am conscious about getting drunk. Yet Komatose is the only place where I’ve let go one night. Entertaining a friend or a client, an office party or a personal one. Komatose has been the answer to most of my answers. From the countless times that I’ve been there to go through the entire menu, it was finally time for change. Their already extensive Sushi menu now has an even more options to choose from. The Uramakis, Nigiris, Tamagoyakis are emblazoned across the revamped menu. But it’s the Indian side of the menu that I’d like to talk about. Jonathan’s Kitchen has been known for it’s continental fare. But little do people know that they can actually dish up pretty decent Indian food too. The Jhinga Khadi Mirch hits you with it’s chili and peppery nature of the prawns. But with a glass of whiskey is what you need to pair it with. Yep the light tingly feeling of chili down your throat as you wash it down with your favorite whiskey or single malt. That is exactly how’d love it. Not fan of the spice then the Murgh ke Parchey and Peshwari Chapli Kebabs should be your choice. I’ve had Chapli Kebabs innumerable times but have seldom seen it as part of a regular menu. Among the seafood is the a beautifully Grilled Pomfret. I’ve ordered it almost thrice now before writing this and the beautiful tandoor color on it is just exquisite. Continental Cuisine has always been Jonathan’s Kitchen’s strong suit. Highly recommended is the Filet Mignon. A nice filet of beef, cooked the perfect medium rare and served with a side of veggies and mashed potatoes. If a bhakt had to sprinkle a million drops of the holy Ganga on me for eating the steak, then so be it. It will still be worth it. Also lemme tell ya that this marks the rise in the standard of how a filet should be cooked…EVER. Literally falling off the shank was my next dish, the Ossobucco. With both of these it’s just the right cooking that needs to be done to get the meat tender and JK get’s it perfect. Ending with the desserts is the Tres Leche and Ghevar with Rabri. I’ve never been a fan of the Red Velvet anywhere and the Tres Leche at Jonathan’s Kitchen combines a Red Velvet with the traditional Tres Leche from Spain. While the people at my table did appreciate the dish, it wasn’t for me. Both of them are a little overtly sweet and people who especially enjoy sweetish-ly sugary desserts will do so. Meanwhile as I leave my table to head back to the Bar at Komatose, I can’t help but wonder how they’ve got another lovely menu on their hands. A comprehensive simple take on dishes and yet a sophisticated look which makes the new menu another standout. Jonathan’s Kitchen just gave me another reason to head back there just for the superb Filet Mignon alone. Tusacany in Trident Hyderabad has been one of my favorite restaurants in the city. The chic and simplistic setting of an Italian household coupled with the dim lighting makes it a beautiful place dine in. The one constant that I really like about Tuscany is that they keep reinventing themselves through their food. With the new Summer Menu, I might just label it as one their best menus yet. And all of this based on just a few dishes that I had. We began our dinner with a Smoked Chicken and Rucola Salad, which believe me is as simple as it sounds. The beauty of the salad lies in the saffron and cheese spheres which had been nonchalantly arranged on the salad. As a salad, it was just the fresh greens and the smoked chicken, but you gotta burst the spheres to let the sauce flow in. The subtlety of the saffron wraps over the entire salad and gives it a whole different texture. Next up was my favorite Carrot and Fennel Soup. Never have I had a soup so refreshing and summery. A cold soup, the soup is served with Orange Sorbet and an almond biscotti. I was literally scraping every last portion from the bottom of the bowl of the wonderful soup. Up until now the dinner had been all about freshness and truly light. This changed with the main course. A Lemon and Thyme Fettuccini with homemade pasta was a delight made over with cream, walnuts and gorgonzola cheese. Alongside on my plate was a Risotto Milanese. Just like any Masterchef show out there, I too believe that the Risotto of an Italian restaurant can make or break the place. I’ve had quite a lot of mushy ones in my time but never at Tuscany. The risotto at Tuscany is perfection and a couple of spoons and you’re set. Again the dash of saffron provides it a burst of flavor in the Risotto Milanese with smoked salmon and fried calamari. Chef Praful has been a wonder with the desserts. Whilst just written as Panacotta on the menu, I sure knew to expect something exquisite. Sure enough he delivered with the cold mango layer between the slices of Panacotta. The plating was a work of art with two Panacottas with the other being Blueberry with the vanilla crumble giving it the crunch factor. It was a marriage of soft and crunch whilst not overpowering with sweetness. The new Summer menu at Tuscany is superbly crafted and one worth visiting for. Take your partner out or indulge yourself for a quiet meal. The food by Tuscany shall not leave you disappointed. It’d been a beautiful journey so far with the ‘Royal Cuisine Trail’ and it wasn’t yet over for us yet. We headed out from Bhopal to Dhar which is about 70 Kms from Indore. With a quick pit-stop on the Indore Highway for lunch, it wasn’t until evening that we were welcomed in the Bada Bangla in Dhar. Dhar as a city was beautiful with the it’s picturesque lakes and barren lands surrounded with trees. As I wandered to the top of the Dhar Fort to watch the sun setting over the city, I could only marvel at the architectural might the Pawars had. We were welcomed at the Bada Bangla which is still being restored. The vast cultural history that adorned the Bada Bangla was astounding. From books in the library from as early as the 18th century to the numerous stuffed tigers spread across the bungalow. There was also a detailed mini structure of the Mandu Kingdom in the lawns. The evening was eventful as we were received by Maharaja of Dhar, Hemendra Singh Rao Pawar and Maharani Shailaraje Pawar at their home. Now for a bit of insight into the culinary history of Dhar which takes it’s influence from the Konkan Maratha style of cooking. The cuisine gives a whole lot of priority to homemade masalas bringing along a fusion of north and south style of Marathas. All of the dishes prepared that night dates back to the Maharaja’s grandmothers. She realized that these royal and historical recipes would soon be forgotten hence she hand wrote all the recipes and handed over these copies to all her three daughters and two daughter-in-laws. The starters for the night Bheja Kachori and Sawal Machli ke Kebab. The Bheja Kahori especially were outstanding. A crisp brown outer covering with soft and deliciously spiced brains, this was a snack worth reaching out for another. I really liked the fresh green chutney which was served alongside which goes on to play a major role later. The dining room had been set as per Indian traditions. The seating was on the floor with the silver plates placed on a higher stool to enable proper eating. The Maharaja was personally there to supervise as we washed our hands over a bowl covered in Ashoka leaves. The food served at Dhar is one that I’ve had innumerable times in Maharashtra but better. Arranged along the thali were Aloo ki Bhaji, Pathawadi ki Rassa, Hari Mirch ki Amtii and Kakdi Raita. 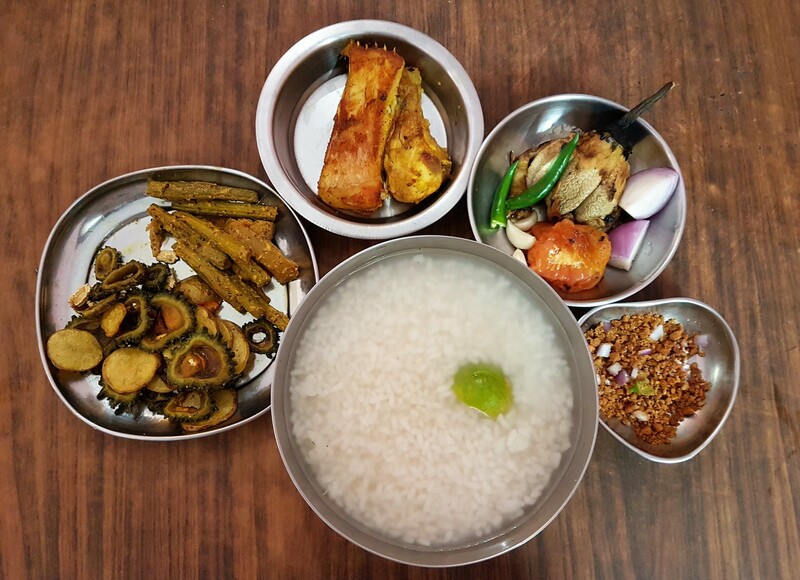 These are all traditional Konkan food which are part of most Maharashtrian homes. But it’s to the hara chutney (Green Chutney) that I had mentioned earlier that I shall now elaborate on. The same chutney was used in marination of the Pomfret fish which was absolutely divine. As Shrimant Jaishree Raje Deokar, the Maharaja’s sister informed us that the fish goes through a double marination and then is grilled in between to soak in all of the flavors. The other fish that night on our plate was the Laal Masale ki Surmai, a simple preparation of the seer fish. A Konkan thali is incomplete without the Sol Kadi made from kokum and coconut milk, a perfect respite from the heat. We ended the meal with some classic desserts featuring the Puran Poli, Rave ke Sheera and Chawal ki Kheer. That night after the lovely meal we headed onwards to Mandavgad, a now ruined city which has been classified a UNESCO world heritage city. But more on that in another blogpost. The culinary history we got to discover through the ‘Royal Cuisine Trail’ was spell-binding. From endless discussions on Indian Family History, rides among the ruins of erstwhile kingdoms and road trips filled with knowledge worth a lifetime. These are memories worth treasuring.